I don’t know why it is, but publishers seem to love books that give you a whole host of bite-sized information on a subject. I can’t help but feel it’s a bit of a dinosaur as far as book styles go, because this is the kind of thing that the internet does so well. Books are better for narrative flow – no one wants to read 80,000 words from a web page – but if you just want a bite-sized intro to a subject, then the web is your oyster. With that in mind, I really have nothing against Hazel Muir’s Science in Seconds. 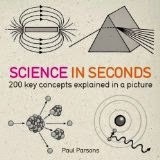 It is a well written collection of very short articles on all sorts of aspects of science. They are so short they tend to be more statement of facts than interesting stories, but they do the job well enough, with passable illustrations in a strange almost square pocket-sized shape. But I am stretched to see the point of it. There are a couple of small moans. Inevitably when trying to cover all of science, some good bits will be missed out and others questioned – it’s the case with any ‘best of’ list. Interesting though hard drives, flash memory and optical storage are, I really don’t think they qualify to rank alongside the big bang, quantum theory and evolution. And if I’m going to be picky, there were a couple of small errors. The explanation of a how a plane’s wing generates lift is wrong in ascribing it primarily to the Bernoulli effect, and a piece on the planets tell us there are 8 in the text, but show 9 in the diagram – but mostly the content is absolutely fine, concise and factful. It’s just I keep coming back to ‘What’s the point’? The press release tells us it is a ‘compact and portable format – a handy reference, ideal for students’. But would a student really buy this as a reference? It has far too little detail to help with a science course. And anyone with a smartphone can access much more detailed references at the touch of a button in an even better ‘compact and portable’ format. I feel like a real grouch here. Just call me Oscar. I genuinely think that Muir has done an excellent job. But to what end? For those who like a bit of publishing speculation, it’s interesting that when I searched for the book on Amazon, this book came up – what appears to be exactly the same book, but written by a different author. What happened there, then?